My name is Haley and this will be my very first experience with gardening. I’m excited but also overwhelmed and a bit nervous! I am totally inexperienced with gardening and I have been trying to read and learn as much as I can so that I can hopefully have a successful year. I’m starting small so that I don’t get overwhelmed and then if things go well, we will continue to add to our garden. What plants should I trellis? Did I leave enough room for broccoli, tomatoes and zucchini? What kind of tomatoes should I grow and where? 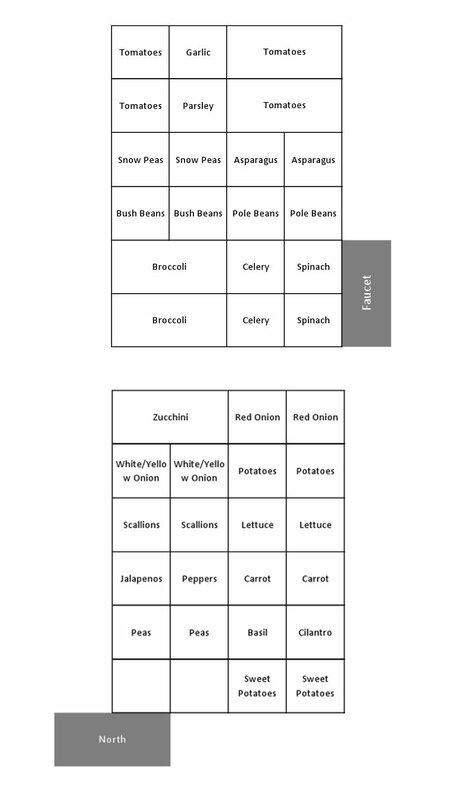 I have no idea how to plan a planting schedule-I don’t want to end up with tons of food all at once, so how should I space my planting so that I have a longer harvest? Thank you so much for the opportunity to get some feedback and help on my garden plan, I really appreciate it! Kathy – I put down weed mat (2 layers) my first year, and my garden beds are FULL of worms. I don’t know how they did it, but within about a year they were definitely present. The weed mat will degrade over time, which means some of my boxes have a little bit of grass in them. It’s minimal and easy to manage. I find that about 10″ of soil is sufficient, and all my plants grow well. You can kill/remove all the weeds, even dig down 6″ and amend the soil with compost, then add your box on top. It would be fantastic, but it’s not necessary. I have a question. After building our raised beds my husband insisted on putting a cover on the ground that will be underneath our soil mixture. This he says will prevent weeds. He also said it was suggested on a square foot gardening web site. However, I can’t get past not allowing worms into the soil and also, what about the roots of above ground plants and also root veggies? Won’t their growth be hindered? Thanks for any help on this. I really want to insist on removing the barrier and having some info to back up my request will help. The garlic, grows great up here (Brigham City) – however, you should plant it the week of Thanksgiving. Most Hardneck garlic actually has to have freezing conditions in order to grow. The garlic I planted last Thanksgiving is now about 2 ft tall. Your layout looks good – I would move a little bit of stuff around – like, the tomatoes, grow closest side to the house – they love the heat and the solar loading heat (heat being released from your house as it cools off in the evening) will keep them warm longer during the night. Also you might look at not growing all the tomatoes next to each other, spread them out – that way if you get a bug in one, it has to go some distance to get to another tomato plant. Good luck – keep us posted! Haley, I live in SLC. I was looking at your plan, and I think it looks good. I would plant something in the space where the asparagus and snow peas are, like a “co-planting” vegetable because the snow peas will be done sooner than other veggies, and the asparagus won’t really get going till next year. How about more basil? You can’t plant it until the soil is really warm (which will be about mid-May here) and they can’t tolerate any frost (also the last frost is supposed to be May 15). But basil is such a great producer in the right conditions, and you can make lots of pesto. Thanks so much for the feedback everyone! I have been out of town, but I’m going to make a few tweaks to my plan and then get started this week! I really appreciate the help and the opportunity to get feedback from pro gardeners. It makes a huge difference, and I can’t wait to get started! I’d suggest you turn the beds so the long length is North/South – that way you can run your tall plants on the north side up a trellis and not block out the sun on your other plants. The sun will go over from East to West and hit all your plants with this method of orientation. I’d put your asaparagus (yes, grow it! ), garlic and potatoes in separate containers. Potatoes take up a lot of room. Get a 20 gallon pot and grow them there. Garlic and Asparagus can take over a bed, better to keep them contained. I have mine in grow boxes so I don’t have to worry about watering them except for a couple times a week. I’m so excited for you to have your first garden! It’s such a fun learning adventure. Building out of untreated wood is easy and inexpensive. My favorite part is that you can use screws and kite string to make your squares–easy to replace and cheaper than any other way of dividing your beds. *Asparagus does take several years to grow, but can grow for up to 15 years after that! If you want to plant asparagus, dedicate an entire bed to it–plant one per square. You want to plan ahead–prep the soil the fall before with tons of manure. Once the plants are in the ground, you only top dress it (add stuff on top) and never disturb the soil. So if you want a good harvest year after year, you need to start with tons of nutrients in the soil. I don’t recommend asparagus for a beginner gardener. *Potatoes are also best grown in their own box. Read more about growing them in a raised bed–you need to take out most of the soil, then add it back in. This can disturb nearby plants. *You will need to support/trellis tomatoes, peas, and pole beans. If you get bush variety sweet potatoes, they won’t need support. But vine varieties will. *You can grow tomatoes in 1 square if you trellis them, and prune them (diligently). I only recommend this for cherry/grape tomatoes. Otherwise, I recommend growing them in 4 squares with large tomato cages (read how to make them). I would grow 1 Roma and 1 Early Girl or Better Boy. If you have space, add a Sweet 100 cherry tomato. Be sure to plant your tall veggies on the north, and short on the south. Unless you WANT shade (like for lettuce), then plant it north of a tall veggie. *Zucchini can be grown in about 2 squares if you prune it. *Broccoli should be great with 2 squares. *Garlic is planted in the fall and harvested in the late spring. Make sure that if you make your beds 4′ wide, you have access on at least 3 sides. If the side you have next to the faucet is against a wall, you need to reduce the beds to 2′. The maximum reach is about 2′, and you need to be able to reach every square. If the faucet is on a wall or fence, you can make the bed 4×6, just put the 4′ length against the wall (turn the entire bed 90 degrees). The only plants on your list that you can plant and grow continually are bush beans, spinach (only grows in spring, replace with something else, then replant for fall), scallions, lettuce (does better in spring as well) and carrots. Plant one square every 2-3 weeks, replant after harvesting. The rest get planted once, and just grow all season. Feel free to update your plans and add the update to your post so we can see what you decided to do. I’d also love to see the beds once they are built and have a report on how things went! Good plan. A couple of suggestions. I wouldn’t use railroad ties or any treated lumber. They are full of arsenic . You can also plan some companion plantings. Your peas, lettuce, broccoli will be done producing by the time you are ready to plant squash, tomotatoes and other warm crops. So you can use those squares twice (lettuce in the spring, tomatoes in the summer). Also be aware of tall plants. You have your tomatoes on the south side which seems like a good idea because they will get full sun. But they will get really tall and will shade everything in adjacent squares. That won’t be a problem for the peas because they will be done producing by the time that the tomatoes get tall, but it could affect your bush beans.